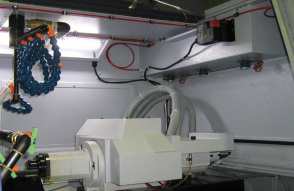 Nobel Stat – X condensed aerosol fire suppression systems are factory fitted, fully tested and certified by qualified Nobel installation engineers to all Star GB sliding head lathes. The Stat-X units are sized for volume protection and are extremely compact, intensively efficient and cost effective to maintain. Units are environmentally friendly with zero ozone depletion and zero global warming potential. In the event of a fire incident, dire detection and system activation is achieved either by the linear heat cable or manual activation through the remote call point. The control panel sends a fire signal to the unit ensuring suppression is rapidly achieved through interference between the ultra-fine aerosol particulate and the flames free radicals, immediately terminating propagation of fire. The Stat-X system has ultra-fast fire knock down and posseses long post fire security due to potassium aerosol being suspended in the air of the enclosure for up to an hour. Due to volatile working environment (when machining with cutting oil) it is vital the Stat-X unit is serviced on a regular basis. As the fire suppression unit is safety critical, only Nobel engineers can maintain/re-charge the unit. Star GB recommend all customers contact Nobel directly to arrange regular servicing. Firetrace® Limited manufacture simple fire suppression systems that operate without the need for electrical power or control panels. The Firetrace® solution uses a linear pressurised detection tube which is heat sensitive. Should the tubing sense heat or flame it will rupture and the resultant pressure loss will open a pneumatic valve and deploy extinguishant via fixed diffusers. 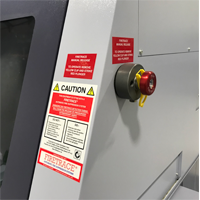 The system is complete with a volt free pressure operated switch which is interfaced to the protected machine to ensure it is automatically turned off in the event of a fire or fault. 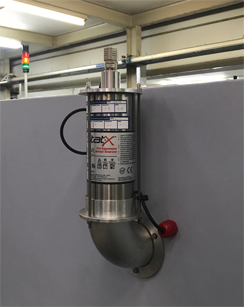 In addition to being fully automatic the system can be activated remotely by simply striking a pneumatic plunger that releases the detection pressure and activates the system. All Firetrace® Systems are fully CE marked. The Firetrace® system requires annually servicing by a competent person. Firetrace Limited can arrange for this servicing or provide free training for the owner’s nominated contractor. The Firetrace® tubing is resilient to cutting oils and unless physically damaged will last between 5-10 Years. The Carbon Dioxide cylinder is also serviceable for 10 Years and has a date stamp to indicate when re-testing is required.